Influencer marketing has now become a major support pillar for many integrated digital marketing campaigns in the country. What started as a bunch of recommendations by ‘influential voices’ on the social web, has now become a full-fledged marketing model over social media. An army of social media influencers can easily ensure ‘trending’ on Twitter, or bring about highly specialized brand conversations down to the general public. Brands are acutely aware of the power of influencers and are waking up to the fact that bringing on board a set of carefully chosen influencers can help ‘make’ their brand. But, influencers are not a homogenous set that can be defined as easily as all those above a certain number of followers on their social profiles. Their ‘influence’ must be a measure of their area of expertise, an authentic and original voice, other genuine areas of interest and the charisma to attract followership. Still, these don’t factor in influencer-driven campaigns; influencer marketing has been heavily exploited time and again, with influencers being ‘forced fit’ into a campaign. The morning starts with positive tweets for a beauty brand while the afternoon is spent in positive tweets for a competing beauty brand. Worse, many influencers work together in factory mode: they copy and paste the tweets sent over by the brand/agency team. The result is, sadly, brand ridicule leading to a negative brand image, which is diametrically opposite to what an influencer-driven campaign was set out to do. 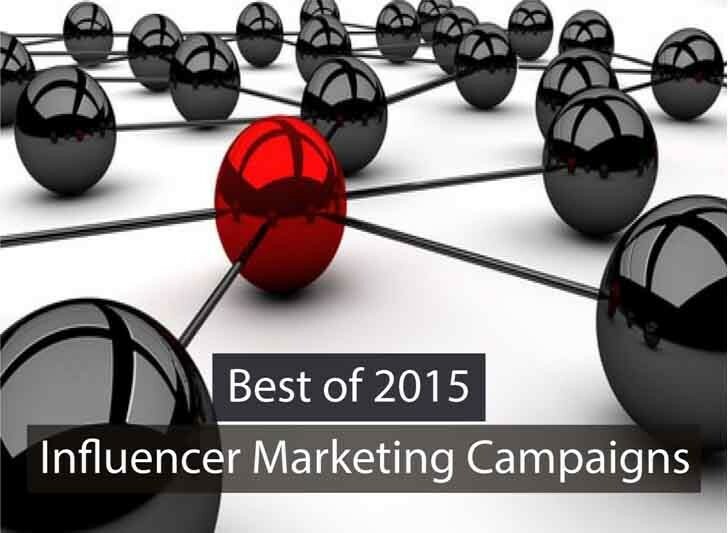 Looking beyond copy-paste recommendations and trying to find a match in objectives, here, we look at the best 2015 campaigns that truly leveraged the power of influencers to help build credibility, campaign buzz and targeted social reach. For the Gusto, Mahindra Two Wheelers’ first automatic scooter developed entirely in-house, the brand launched an innovative influencer-driven campaign involving food lovers in a city. It arranged a food ride called the #GoGustoRides led by influential food bloggers that saw a group of food enthusiasts explore their city’s most famous food joints riding their Gusto. While the first edition was in Mumbai, the second one was held in Bengaluru making the Gusto a scooter for fulfilling your ‘gusto’ in life. Read more on the Mahindra Gusto #GoGustoRides campaign. Four popular Twitter influencers were roped in for the new Tata Bolt a day before its launch. The idea was to generate buzz amongst its TG of social savvy millennials. Rather than have these influencers tweet and make noise about the launch, Bolt hosted a unique digital reality show #GetSetBolt that also involved participation from their respective community. The four of them were enclosed in glass cubicles. To get out, they needed to get the symbolic Bolt key by generating the maximum buzz amongst their followers. Read more on the Tata Bolt Get.Set.Bolt campaign. For the launch of its compact sedan Figo Aspire, Ford had kickstarted a pre-launch campaign called “What Drives You?” The objective was to discover the aspirations driving modern India, much like the new sedan that reflects the needs of the young consumer. And to discover what young India aspires for, Ford roped in Farhan Akhtar as an anchor to bring forth passionate stories of real life achievers. Phanindra Sama, Co-founder & CEO, RedBus.in, Rajat Tuli and Rahul Anand, Co-founders, Happilyunmarried.com, Indrani Medhi, Researcher, Microsoft Research India and Lakshmi Pratury, Curator, INK, shared their story in a drive-by interview with Farhan while he drove a Figo Aspire. Read more on the Ford Figo Aspire #WhatDrivesYou campaign. Vistaprint, an online print store that offers business cards, printed or embroidered apparel and other business marketing needs like brochures, flyers, etc, had launched the #ChaltaHaiKoChaltaKaro campaign with a series of ad films throwing light on offline printers’ woes. To bring alive the message, it chose real life heroes – young entrepreneurs who chose not to fall victim to the ‘Chalta Hai’ attitude. A series of films celebrating this very spirit featured Arunabh Kumar, Founder of new age media company, The Viral Fever; Ankita Tandon, Founder of Coupon Dunia, Anuj Goyal of Brijwasi Sweets who share their story of success and how they broke the ‘chalta hai’ norm. Read more on the Vistaprint #ChaltaHaiKoChaltaKaro campaign. Citibank was looking at engaging foodies beyond traditional bank marketing and making ‘Dining the new cool’. The idea was to tap into mobile consumers and get them to create their food journey armed with its Citi Dining offers. The bank teamed up with two of the top food influencers, Maria Goretti and Kunal Vijaykar and influencers on Zomato, one of India’s most popular food search and ordering service for a digital-led food marathon called ‘#WhatsOnYourPlate’. The two food influencers drove an online debate to find out which of the two cities, Mumbai or Delhi, had the most amazing food. Read more on the Citibank ‘#WhatsOnYourPlate’ campaign. When coconut hair oil brand Parachute Advansed rolled out its digitally-driven campaign to spread the ancient Indian art of oiling, it roped in beauty bloggers at the launch, where they were trained on the various techniques of oil massages. More than 30 influential bloggers in the beauty, health and makeup domain were invited to the launch event that included a live demonstration by the massage expert Moses Chund. These bloggers documented their experiences to further amplify digital reach of the do-it-yourself videos and oiling techniques with their relevant community. Read more on the Parachute Advansed ‘Art of Oiling’ campaign. Lenovo wanted to illustrate how its YOGA products embraced unexpected or weird design and functionality, so that its owner could do amazing things with it. It launched #GoodWeird, a global marketing campaign that had an India leg featuring creative folks who did amazing things with their Yoga products. It created a series of films that chose creative storytelling rather than the usual documentary approach, featuring Eina Ahluwalia, India’s first conceptual jewellery artist; Chef Saransh Goila who creates his own fusion dishes; fashion designer Nikhil Thampi. Each of their stories tells you how their creativity and the flexibility of Yoga tab can create something GoodWeird. Read more on the Lenovo #GoodWeird campaign. The Economist India Summit sees the country’s opinion leaders indulge in a day of debate and high-level discussion exploring key political, economic and social issues and what they mean for business. The challenge for Standard Chartered, Founding Partner of Economist India Summit, was to bring the Summit talks to the common man. So it created #SCInsiders, an army of four people from diverse backgrounds – a food writer, a musician, a movie director and an energy researcher – each a noted name in their respective fields, to attend the Summit and share their takeaways from it, each from their unique perspectives. They tweeted from the session with their unique takes, and also shared facts from the speakers, while encouraging discussions over Twitter in real time. Read more on the StanChart #SCInsiders campaign. Online financial services company, Quicko roped in industry veterans for its public service campaign #RightToPayTax, launched during tax filing season this year. A series of videos featured biggies from the media industry make an earnest appeal that it is our right to pay tax, not a duty. The influencer-driven video campaign saw the likes of Mahesh Murthy, (founder, Pinstorm and founding partner, Seedfund), Ayaz Memon (noted columnist and sports commentator), Bharat Ranga (former chief content and creative officer, Zee Group and founder RanCorp), KV Sridhar ‘Pops’ (chief creative officer, Sapient Nitro, India), and many others. Read more on the Quicko #RightToPayTax campaign. Leveraging cricket season this IPL8, taxi service provider, TaxiForSure had launched its Twitter videos-driven digital campaign #MadnessForCricket, with the help of a cricket influencer. Fans were invited to share their #MadnessForCricket on their Facebook or Twitter timelines, and two were chosen to challenge cricket junkie, quiz freak and presenter, Gautam Bhimani on a one-on-one quiz. They needed to ask him anything in cricket and he would answer; if they managed to stump him, the winner was gratified with TaxiForSure voucher. The challenges were captured through Twitter videos and led to real time engagement for the brand. Read more on the TaxiForSure #MadnessForCricket campaign. Amazon India has been working hard at instilling e-reading habits in the country, ever since it launched the Kindle Paperwhite in India last year. As part of its #CrazyForReading promotional campaign this year, Amazon roped in two of India’s bestselling authors, Ashwin Sanghi and Amish Tripathi to endorse the e-reader. Two films captured the authors’ reading habits on the e-reader, taking the viewer through their journey of reading books to now reading on their Kindle, while the two share the helpful features of the device. Read more on the Amazon India ‘#CrazyForReading’ campaign. Mountain Dew, PepsiCo’s citrus flavoured carbonated drink extended its brand ideology to making a name by taking a risk (Naam bante hain risk se). Although the TVC starred brand ambassador Hrithik Roshan, the brand brought on board real achievers who have risked their lives to make a name in history. Padmashri Arunima Sinha, the first woman amputee to climb Mount Everest, all with the help of a prosthetic limb and a rod in the other leg; Padmashri Shital Mahajan, the skydiver with over eight world records including youngest woman to jump over North and South poles, and many others comprise the video driven #NaamBanteHainRiskSe campaign. Reebok India, one of India’s leading fitness brand wanted to strengthen its brand mantra #FitnessIsForEveryone and also build an online community of fitness trainers and enthusiasts. It teamed up with Chetan Bhagat, a popular and highly influential writer, for its campaign ‘Reeboot 100’ – a 100-day transformation program with a diet and fitness plan designed for Bhagat. Designed by Reebok master trainer Vinata Shetty, the Reeboot 100 fitness challenge included a range of fitness activities such as cardio training, functional movement training including running, crossfit and yoga. While Bhagat followed his plan, he shared about his progress with his large follower base on social networks, while building brand awareness. Read more on the Reebok India ‘Reeboot 100’ campaign. Instead of roping in a general celebrity to promote its LED TV, Micromax roped in domain expert celebrities in the brand campaign. Celebrity sports commentator Harsha Bhogle, acclaimed director Anurag Kashyap and popular music composer and singer Amit Trivedi talk about the importance of clarity, sound and colours in the LED TV campaign. In the video-driven campaign, Anurag talks about the importance of colour saturation, while Amit talks about how critical are individual musical notes for a background score and Harsha describes critical moments of decision making in cricket. Read more on the Micromax LED TV campaign. As part of its global marketing campaign #MakeItHappen to build awareness for its Lumia branded smartphones with Microsoft Phone 8.1, Microsoft Devices roped in influencers like actress Kangana Ranaut, badminton champ Saina Nehwal and MasterChef India winner, Pankaj Bhadouria for its India campaign. The idea was to showcase how ordinary people can achieve their dreams. Three films featuring each of the influencers had them communicate with people through Skype and the Lumia phones to share what hardships they faced personally before ‘making it happen’ in their lives. Read more on Microsoft Devices #MakeItHappen campaign. Memorable experiences leave impressions on followers and the audience at large. Influencers often help filter out that which is relevant to a brand’s target audience, and influencer marketing if done well, can lead to favourable results. It is nice to see brands making the efforts to identify the right influencer fit for their brand.